Grain farmers provide the most calories and protein at the least cost. For those who didn't know, the energy requirement to produce an equivalent amount of 'meat' calories is multiple times higher than for grain. The simple reality is that to feed the world, grain farmers will lead the way. 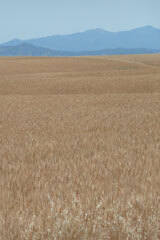 Yet, current grain farming methods are highly stressful to the soil and water resources. Another major issue now confronting grain farmers is the question of genetically modified seeds. Traditional seed grain markets have become the target of large agri-business. If the large seed/research companies come to dominate the seed market, the traditional farms that grew their own seed will be driven from business. At a rapid pace, the progeny of ancient, natural grains that sustained our families for generations will be displaced by hybrids created in labs. Some products of the agri-business complex may threaten the human race more overtly. In the past ten years, there were plans to create the "TERMINATOR" seed, produced by Monsanto Corporation that would be made artificially sterile. Such a seed would make farmers highly dependent upon centrally controlled seed production. If something happened to this central facility, and our ancient-self reproducing seed had disappeared from farmers’ bins, the human race could face mass starvation. Cooler heads prevailed, and farmers continue in large numbers to use natural grains, but the trends are ominous. Our advice to grain farmers: the human race is counting on you to maintain your independence and to maintain inherent variety; to consumers: continue to support naturally reproducible grains. We believe if it was good for YOUR grandparents, it is good for YOUR grandchildren.